Want to win a spot for you and your buddy in the 10th Annual Mike Missanelli Open presented by Corona Premier? Join Natalie Egenolf on Wednesday, April 24th from 7-8pm at The Post (129 South 30th Street in Phila). Enjoy $4 Corona Premier, win great prizes and the chance to tee it up with Mike and the gang. 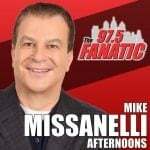 Want to win a spot for you and your buddy in the 10th Annual Mike Missanelli Open presented by Corona Premier? Join Natalie Egenolf on Thursday, April 25th from 7:30-8:30pm at Duffer's Pub in Concordville (996 Baltimore Pike). Enjoy $3 Corona Premier, win great prizes and the chance to tee it up with Mike and the gang. Want to win a spot for you and your buddy in the 10th Annual Mike Missanelli Open presented by Corona Premier? Join Natalie Egenolf on Wednesday, May 1st from 7:30-8:30pm at Station Taphouse in Doylestown (194 W Ashland St). Enjoy $3 Corona Premier, win great prizes and the chance to tee it up with Mike and the gang.